Best way to make an enemy out of a pilot? Shoot him out of the sky. It is believed that Scrap-Iron is a product designer for the armament company owned by Destro. Scrap-Iron carries out initial field-testing on all new armor-piercing munitions and sub-munitions. His area of specialization is remote-launched, laser-guided, rocket-propelled piezoelectric fused anti-tank weapons. These weapons are categorized beyond the "smart" stage and are known by the nomenclature "brilliant." He is methodical and precise; he plots moves, countermoves, and counter-countermoves to anticipate all possible scenarios for a given situation. He frequently irritates others with his demands for perfection, but he is tolerated because everyone knows that he always gets the ultimate job done: to completely disable any and all approaching enemy vehicles. Scrap-Iron was kind of a chronically underused character, in both the comics and the cartoon. A chessmaster with borderline-OCD and a love of blowing things up? He could have been huge! Instead we got Dreadnoks, Dreadnoks, Dreadnoks. There was already a G3 Scrap-Iron released in one of the internet-exclusive "extreme conditions" battle packs, but this one actually looks like the old figure. He uses Cobra Trooper limbs and a Viper chest. The uniform is blue, and he's wearing black gloves and kneepads. His boots are bright red, matching the removable vest. The pocket on his right leg is black, and the straps on his left leg are red. 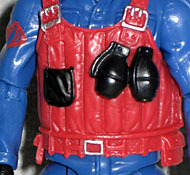 The vest is sculpted to look padded, and there are black grenades attached to the front. Scrap-Iron's head is unique to him - which means it's the same used for three other G3 versions of the character. He's wearing his rounded helmet with the angular snake crest on the forehead (which is why he's considered a Cobra and not an Iron Grenadier). His visor is removable, revealing the heavy scars and blank white eye beneath. Super creepy! Guess he stood too close to one of his tests. 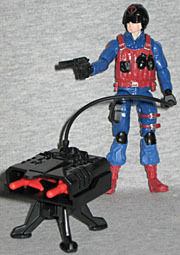 Other than the vest and visor, Scrap-Iron's accessories are a large black pistol and a freestanding rocket launcher. The launcher is made of three pieces: the body, the stand, and the remote control. There are two short, red missles that fit in the launcher, but don't worry - it's not spring-loaded, so they just sit in there. The peg that connects the launcher to the stand is the same size as the holes in the modern figures' backs, so he can wear it like a backpack. Though he's never done that before. Slow talking and easygoing, Wild Bill doesn't let anything shake him up. In situations where other people might lose it completely, Wild Bill just keeps on doing his job. This doesn't sound like much, but it means a lot to the GI Joe team if they are pinned down on a hot landing zone waiting to be picked up. Piloting a helicopter in combat requires a unique combination of skill, stamina, physical coordination, and spatial perception. Helicopter pilots are trained, not born. He can pull maneuvers in the air that defy gravity (and sanity), and he has a pretty mean right hook - just ask Scrap-Iron. 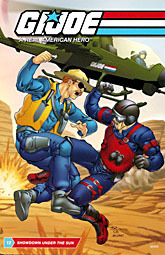 This Wild Bill is the same as the previous release, just done in cartoon colors: his uniform is blue (several shades, in fact), and his vest is yellow. He still has his six-shooters, but they're white with black grips. His hat is tan with white detailing. He also includes a blue helmet with black goggles, and like we've said before, his pea-sized head doesn't look as bad when he's wearing the helmet instead of the hat. Wild Bill and Scrap-Iron go fist-to-fist and barrel-to-barrel in a wild chase through the desert. The entire battle is told through radio transmissions as the G.I. Joe team and Cobra forces face off in a high-altitude - and high-attitude - pursuit! Instead of a reprint of an old comic, this Comic Pack has a new story written by Larry Hama. "Showdown Under the Sun" is #12 under their new numbering. It's a fairly straightforward story, a decent one-shot action piece with the midly clever gimmick of having every line of dialogue in the story delivered via color-coded radio transmissions. Like many Comic Packs, this one features one must-have character and one you'll probably throw in a box and never look at again. At least there's a good, logical reason for the Wild Bill repaint's colorscheme - there's never been a version of him in cartoon colors, and yes, that includes the 10 G1/G2 figures. The choice to use Cobra Trooper legs for Scrap-Iron wasn't the best, but it was good enough, and this is the only way to get his classic design. I wanted this set when it first came out, but the price made it not worth buying: luckily it showed up at close-out stores in November of last year, so savvy shoppers could get the pair of figures for the same price it would have cost if Scrap-Iron were ever solo-carded.